Lobbyists for any cause will invoke its importance, its relevance, its benefit to children. 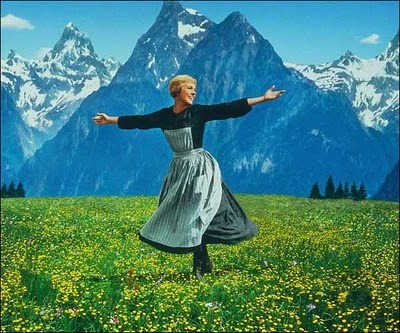 Music gets decimated because although the benefits to students are overwhelming, the people charged with defending its validity appeal to things like motor skills and math and wide-armed Julie Andrews singing during the Anschluss. Since math is already taught, and most kids develop decent enough motor skills through normal daily activity, the case usually is based on the dreaded Go Tell Aunt Rhody†. Were it my job to decide where to spend money, I would not hesitate to slash music based upon these arguments. Clearly athletics provide more positive opportunities for kids, which is why they have the most rabid boosters, lots of support, and are rarely entirely removed from a school. California is facing a 21 billion dollar budget shortfall. The inmates can’t run the asylum forever, and the spendy ridiculousness is about to come to a screeching halt, one way or another. It’s bound to get really awful around here, and yet I would argue that music education should be preserved not as a luxury, but as part of the solution to our woes. One of the things that seems to be consistent among successful people is the way they see the world. There’s a largeness to it. A broad perspective that allows one to see potential in every situation, and to realize that no matter what injustice is heaped upon you, excuses don’t make for success. Exposing kids to classical music from an early age adds a facet to their lives that would otherwise be relegated to the realm of exaggeration and stereotype: that only uptight rich people partake in anything that involves an instrument like the cello, clarinet, or French horn. We’re not trying to create the next generation of musicians. There seems to be a glut of immense talent that gets fostered to the point of conservatory education no matter the economic climate or violent swing of the cultural pendulum. What happens in your average music class is a deepening of experience. 1) How to face difficult tasks. 3) Personal responsibility. How to handle a delicate, relatively expensive item that they have to share. 4) To cultivate patience with themselves. 5) To increase attention span. 7) To unleash unexpected creativity. You never know which kid it is until a few classes in, but someone in there feels “Ode to Joy”. It’s easy, especially with the current paradigm, for youngsters to feel the grown up swagger of artists like Jay-Z*. There’s a pridefulness to it. When you’re carried off by classical music, it seems to pass through you, not be about you. It’s a different way to relate to achievement, and to one’s self. As a side note, I tend to get amped up for classical performances with rock music. I’m not a proponent of snootier-than-thou piety with my Schubert, thanks. 8) To experience a relatively benign subculture. 9) To preserve tradition. In an age of “If we used to do it, we don’t need to do it any more”, I would submit that an adjustment may be overdue. We have on our hands two consecutive generations of children that relate with more familiarity to a handheld DS than other humans. Would you like some entitlement to go with that, or are you cultivating more of a victim mentality under that scowl? Music makes it cool to relate to a large group of people. To want to achieve something, to risk failure. This is character building, cloaked in a melody. 10) Time spent playing an instrument is time away from television, bullies, worries, homework, poverty, grief, pressure, and a whole host of other sources of anguish. The cello got me through more than my fair share of devastation, including the back to back deaths of a musical hero and an unrequited love in my junior year of high school. I played my fingers right off, and the sadness had a constructive place to go. Music offers a juicy alternative to the vagaries of young frustration. I have seen more than one kid go from a juvenile shoplifter heading towards more serious criminal endeavors to a Stevie Ray Vaughn obsessive, spending countless hours picking through solos and annoying his parents with a loud stereo. Better to have him home and safe than out and experimenting with the boundaries of the law. Something to consider: you don’t need to perform some swashbuckling piece of administration to provide these benefits. Perhaps the most important thing kids get out of music is the sense that an adult is willing to invest in them. Having expectations is a great way to show a child that they have more potential than they know, and to introduce them to the cycle of hard work+persistence=payoff. I have a few students on scholarship: I give them complimentary lessons so long as they work hard. They see my investment, and they feel compelled to invest in themselves, too. They flourish right before my eyes, and leave as better people. Now that’s gotta be a good talking point. † As a music educator, I could, and do listen to that song all day. It does actually represent something special. But as activists for our cause, we have to appeal to people who do not share our values, and to make a more compelling case. Hear, hear! I personally do not believe that the study of music needs to be justified by anything other than: Music is good for you. Beautiful job outlining all of the things that can mean. Yay Sean! Teaching is fabulous: I say over and over that I really felt the beginnings of mastery when I had to explain the basics of playing. Keep me apprised, and thanks for reading! Only a $21 billion shortfall? So when I move to CA in 6 months, expect to be jobless. You certainly present a well-laid article! Emily, as an elementary school teacher, I am in agreement. In my school my students are fortunate to have music and visual arts twice each week, and a third music class if they are playing an instrument. In fact, at my school, teachers who are interested take instrumental music lessons alongside their students, which is how I started playing cello. Faculty and students take lessons together, rehearse together, and perform together. It is a good object lesson for teachers to be reminded of the challenges of learning something new. Our winter concert is January 21 and we'll be playing an open and first finger Pachabel, as well as a minuet in the style of Haydn. What a great post! I have two budding violinists, who are mostly interested, but they occasionally ask WHY?? (practice, bother, usefulness, etc). Your blog is really, really good. I am glad I can finally get past stupid Yemenet and post comments. What a well-written post on music education.